Relax and sun worship on this sleek, colorful inflatable lounge. 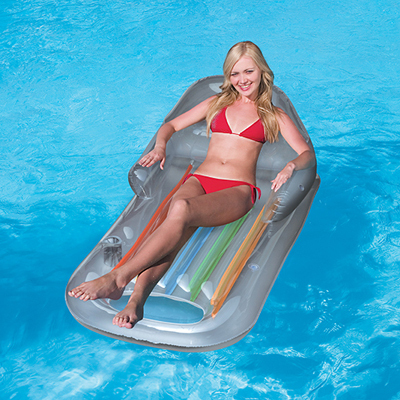 Made of heavy gauge vinyl, this lounger is contoured to provide superior comfort and relaxation. The transparent top and white or metallic reflective bottom comes with a rainbow of colorful inner I-beams. With built-in arm rests, back rest and cup holder, this Designer Fashion Tanning lounge will be a must-have this summer. Durable PVC with dual air chamber construction. Includes repair patch kit.